Governance and management are a major part of getting security right. How do you measure up? Without the right policies and processes in place and enforced, no organization is truly secure. Info-Tech’s Security Governance and Management scorecard lets you measure your performance against industry standard best practices. Use this report to understand your current strengths and weaknesses, then follow Info-Tech’s customized roadmap of practical and prioritized action items to improve and optimize your security governance and management. Measure success in terms of meeting industry standard best practices. Info-Tech’s Security Framework Model is derived from COBIT and TOGAF, two globally-accepted frameworks used by businesses to optimize the value of IT. Communicate current strengths and successes, and use year over year comparisons to build on these successes and measure long term progress. Identify areas for improvement and optimization, and justify allocation of resources and effort toward these goals. Chart your course to security success. These reports consolidate the customized action items arising from your security governance and management scores, and present this information in a unified and prioritized format to guide your next steps. Info-Tech’s Security Governance and Management Maturity Scorecard is designed to apply to all organizations, regardless of size or industry. Download a preview of the report to see the value it can bring to your organization. 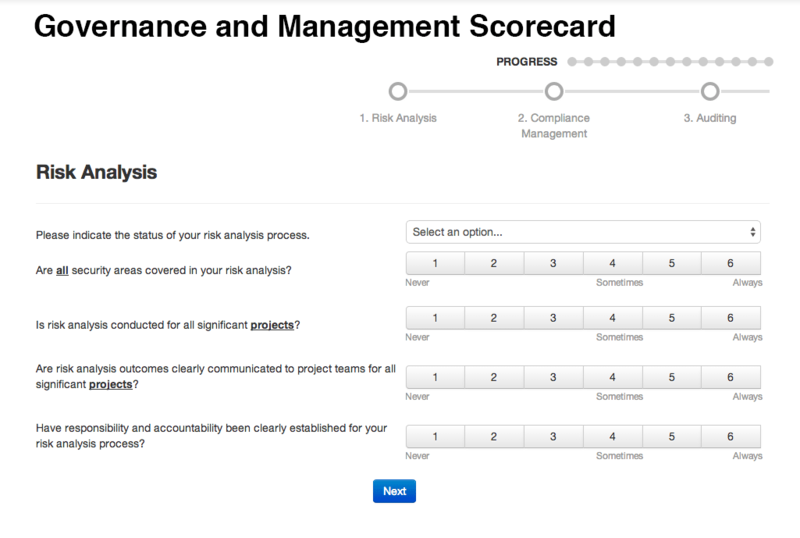 Preview a sample of Info-Tech’s Security Governance and Management Maturity Scorecard survey. This 60 question survey should be completed by your organization’s Chief Security Officer or equivalent, and is designed to be quick and user friendly.